At the moment they just indicate that there is a thumbnail photo of that ship downloaded to the PC. Another shot of the Irish Sea and Isle of Man area. Great screenshot Allocator - really busy. Just caught this lone tanker "swimming with the dolphins" at Chanonry Point!! Good to see the NASA satellite map server is responding better now. With EGPE in shot, it made me think. Would be great to combine Radarbox and ShipTrax on one map!! I keep forgetting about the satellite download! When You have PlanePlotter and Shipplotter it can be done, application is called CombiPlotter at Coaa website. 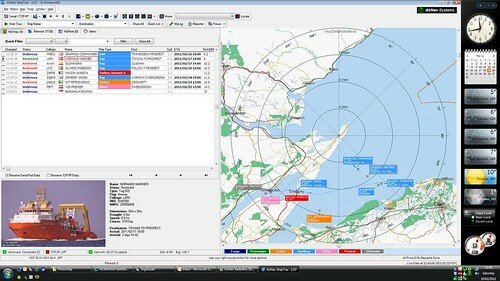 For me not really usable, as map scale of spotting planes and ships is very different..
Busy again out in the Moray Firth.